Going back to school following summer break has been an exercise in positivity. Imagine seven glorious weeks where your entire life is in your control. Write whenever you want, do yoga whenever you want, visit friends and family whenever you want… Okay, maybe that is my vision of freedom, not yours, but you get the idea. Then, suddenly, your life belongs to thirty (deserving) children once again. It’s like the ultimate post-vacation hangover, because you aren’t just lamenting a week or two passing, you’re letting go of what has become a habit-forming, newly-adapted lifestyle. You get a really good taste of freedom and then it’s gone, and when I say gone, I mean welcome to one of the most draining, time-consuming-yet-equal-parts-rewarding jobs on the planet. But, this is the real life of a writer and human being, bills need to be paid, and other passions need to be fed, which in my case, means teaching children, at least for the time being. Eight weeks into my return to the classroom, I find it hard to believe an entire “summer” has passed since my cherished seven weeks ended. Overall, I have adjusted and am finally getting back into my groove, but I still miss the freedom. 2. Unwired Wednesday. After a state of near tech burnout Tuesday night, I decided Wednesday would be computer-free afterwork. 5PM, I shutdown my laptop and did not look back– a glorious return to hot yoga after two weeks of finding excuses, delicious dinner with the husband, and the second episode of Downton Abbey’s newest season. A-M-A-Z-I-N-G how the simplest evening can feel so good. Thinking Unwired Wednesdays might become a tradition. 3. Today marks four working days until my week-and-a-half fall break. Looking forward to sending out my query letters, celebrating my three-year wedding anniversary in wine country, attending Hardly Strictly Bluegrass with my much-missed Bay Area friends, and spending time with my mom in Mt. Shasta. As much as teaching can wear me down, I am also incredibly grateful it fluctuates between busy and freedom. Going back to a life with only 3 weeks off a year seems unthinkable, (unless, of course, I’m writing novels…). So, what are you most grateful for today? 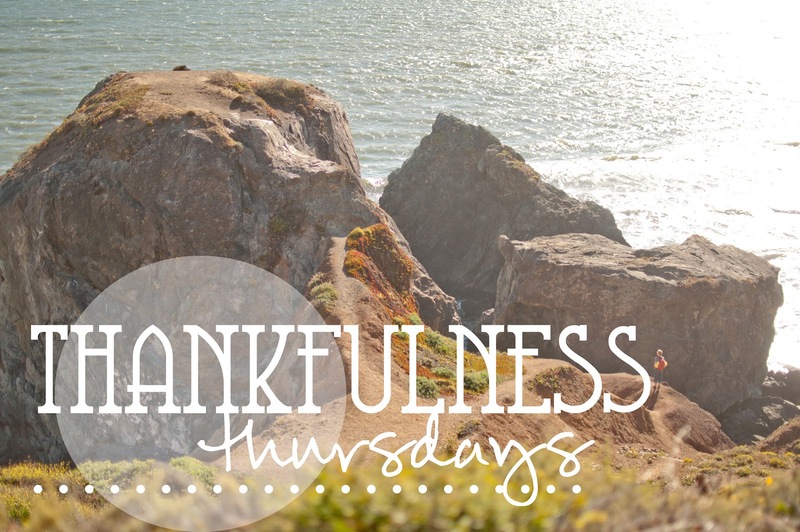 Feel free to jump on the Thankfulness Thursday bandwagon and borrow Ashley’s lovely graphics. Above all, here’s to being healthy and alive! Great post Olivia. I can totally relate! I think I will have to share these ideas with my already burned out colleagues. It may not be Thursday anymore, but I am thankful my Internet connection is back up and running. Going a day without the Internet really makes me appreciate that it can be more than just a time waster. Love the idea of Unwired Wednesdays! I could definitely use a evening of no computer distraction! And the story of the girl wearing a cardigan! So precious! Yes, maybe Unwired Wednesdays needs to become a trend! Added my name to the link, (and learned afterward what to enter in the name part, haha, oops! ).